I have a used 25' steel tandem boat trailer, at a local trailer shop, for upgrades to axle and brakes. I've found lots of postings for diagrams or photos, but due to time and technology, I can no longer find the linked documents. Any help would be great, even if it's for measurements that you wish were different. A beginning point is what I need. Attached is a photo/drawing of my original C22 trailer. I used this as a reference point for my new bunk design. Hope it helps.. I was happy to get actual measurements & even nicer they are on a photo. I realize now, I was asking "how long is a piece of string?". So I made a drawing, and it has lots of errors, I'm sure, because I could not find a technical drawing for the chrysler trailer for C22. It seems to be the only one missing in the catalog. 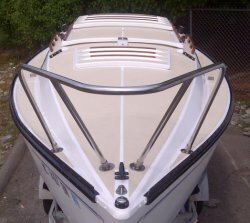 Does the keel rest below the height of the sides of the trailer? And by how much? Here's someone else's trailer that I drew I diagram of. I found his measurements for bunks in his posting history, and I'm off a little. Bunks = 8' // Rear support (A) = 22" // Forward support (B) = 16"
Here is yet another trailer diagram, based on a Craigslist photo. I think this is closer to what my trailer looks like, I just want the bunks to be as low as possible. Can anyone confirm or correct these guesses of support heights or roller placements? Adding some strap launch pix I found online. Wow thanks for the photos! Now I understand your trailers have little to do with the original Chrysler trailer. I will be studying your photos, and coming up with my interpretations of the measurements.